Robs Webstek: Princess Maria Day ! 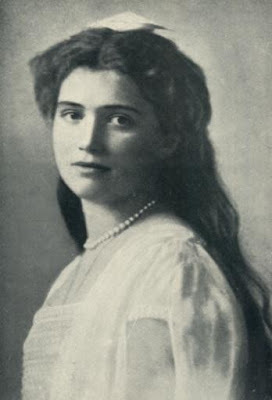 Today is the birthday of Grand Duchess Maria Nikolaevna Romanova. She was the third daughter of the last tsar of Russia, Nicholas II, and his wife tsaritsa Alexandra. Her middle name Nikolaevna means daughter of Nicholas. In the julian calender then used in Russia, she was born June 14th. Maria was open and down to earth. She was friendly and easy to speak to. She hardly got into trouble and was very loving and considerate. She and Anastasia were best friends. Since Olga and Tatiane, who were very tight together, were called "The Big Pair", Maria and Anastasia broke off into "The Little Pair". My dad grew up in rural Oklahoma in the 1920s. There were many Russian immigrants who had settled there. He said there were persistent stories about a lady that lived nearby being "the" Anastasia. He said he never believed it to be true, but there were many people living there that would swear by it. I remember reading about the recovering of the graves, and then DNA proved all the fake Anastasias wrong. Unfortunately.